My new film scanner came in a couple of days ago, so I’m chipping away at old negatives again. This sleeve was labeled Jean Bell Mosley and son, 8/3/1967. 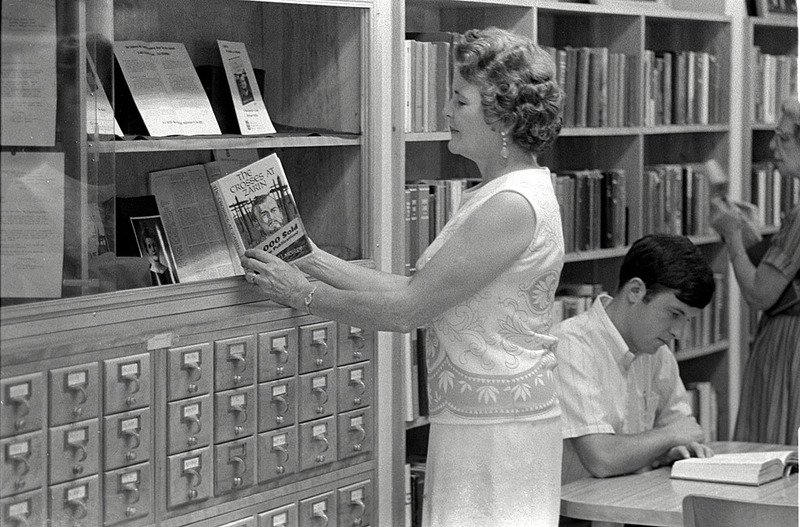 This must have been taken shortly after Mrs. Mosley wrote The Crosses at Zarin, the book she’s holding. Her son, Steve, is at her right. I’ve been racking my brain to figure out who the woman is on the far right of the picture. I KNOW I know her, but I can’t put a name to the face. 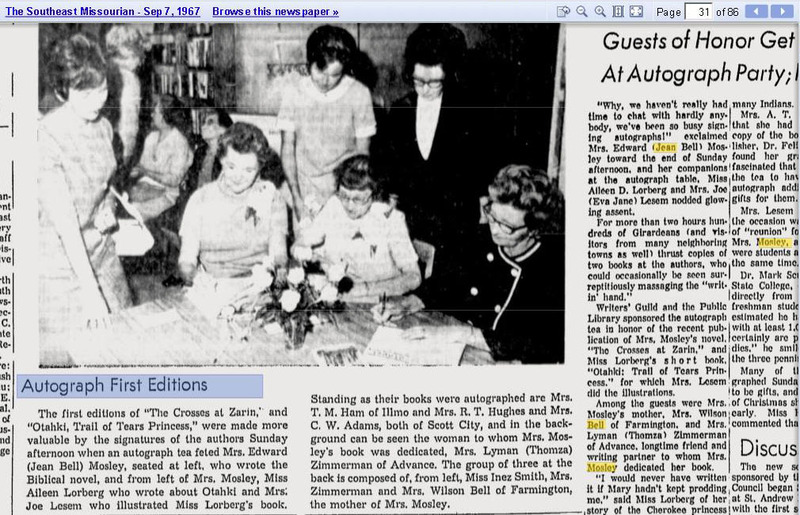 The Sept. 11, 1967 Missourian carried a photo and story about Mrs. Mosley and Miss Aileen Lorberg signing copies of their books at a tea. Miss Lorberg wrote Otahki: Trail of Tears Princess, which was illustrated by Mrs. Joe Lesem. You can read the whole story in Google Archives. The story mentions that Mrs. Mosley’s book was dedicated to Thomza Zimmerman of Advance, her longtime friend and writing partner. Thomza was one of my grandmother’s best friends. I spent a lot of time at her house. For more background, go to Jean Bell Mosley’s website. She was a fascinating character who wrote books, magazine articles and a well-read column in The Missourian from 1955 until shortly before her death July 11, 2003. 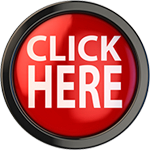 The website contains links to many of Mrs. Mosley’s columns. She paints pictures with words that are more vibrant than what some of us can capture with cameras or brushes. There’s a link on the site to a video interview Matt Sanders did with Steve and Viney Mosley about Steve’s mother. About a third of the way through, I was surprised to see a frame similar to the one at the top of the page pop up. I guess The Missourian must have held on to more of my photos than I thought. This won’t make a bit of difference to anyone, unless they go looking for Jean Bell’s columns in the Missourian prior to 1986. She actually wrote for the Bulletin-Journal. 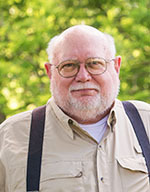 When Gary Rust bought the Missourian, her writings started appearing in the Missourian. So, prior to July 1986, you’ll find her in the B-J. Mrs. Mosley was a wonderful woman and a great neighbor. I miss seeing her sitting on her porch swing or out walking among the many flowers in her back yard. Shortly before her death she, and the lady who helped her with her house and gardens, transplanted a beautiful sweet-smelling Climatis plant at the end of the fence between our yards. I always think of her when I go out and smell that sweet fragrance. The lady on the far right, was that Miss Lucille Adams who taught typing and bookkeeping at CHS? Yes Sue, I too can see her and Ed sitting on the back porch. When she was working on her books or columns and she wanted some peace and quiet, Steve would come to my house and we’d play on the swing set, in the sand box and usually wind out getting into a fight. Oh…….the younger years were great. LOL They were great neightbors. I knew Mrs. Mosley well. She was like my 2nd mother. Steve was my close friend and we were at each others house almost daily. I got very close to Mrs. Mosley and her husband Ed. She can be remembered as a kind,brillian,caring and wonderful woman. I truly enjoyed her and Ed’s company, although I think they were always somewhat pleased when Steve and I would leave the house to play cork/wiffle ball, basketball, flag football or other activities that gae them some peace in their home, while we were away. She was a wonderful woman and mother to Steve.